From our first shop in Highbury to our newest location in Bloomsbury, we've always believed in the importance of a temperature & humidity controlled cheeseroom as the perfect environment for storing our cheese. 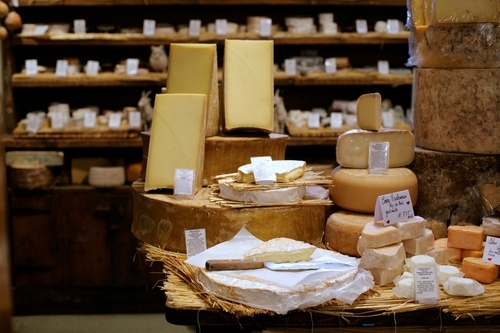 Explore our cheeseroom and learn more about the cheeses we supply. LA FROMAGERIE carefully sources its wines, specifically chosen by region to complement our cheeses and our tasting menus. Our house wines are from Fromerton near Toulouse, and our House Rose is from Validition in Provence. We also carry a selection of fine wines hand-picked to partner cheese beautifully. Our staff is delighted to assist you when choosing wines to accompany a specific dish or a selection of cheese. Please note that we offer a 5% discount on all cases of 12 bottles (including mixed). Delivery in central London can be arranged upon request. From our homemade pesto (using Patricia's recipe with five different pecorinos and our three-year aged Parmigiano-Reggiano) to our homemade tomato ketchup (essential for burgers and bacon sandwiches), our shops offer a range of made in-house products to help you stock your fridge and pantry with the best quality essentials. 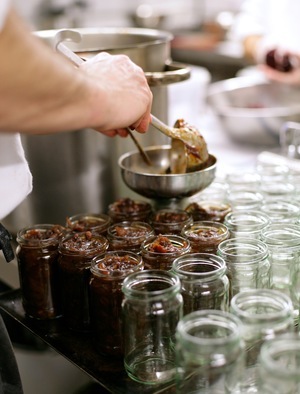 Throughout the year our kitchen makes seasonal jams, chutneys, preserves & pickles. During the winter months, we begin with marmalades using the best citrus from Italy. As the seasons change, we specialise in summer fruits such as apricots, strawberry, raspberry & plum, then in autumn moving onto spiced green tomato chutney, piccallili and onion marmalade – all perfect accompaniments to cold roast meats and mature farmhouse cheeses. Other customer favourites include our homemade granola and muesli, our homemade hummus and taramasalata, and (when available) our cultured butter and the remaining buttermilk made by our cheesemonger Max. In December 2010 we launched our own line of biscuits specially designed to complement our farmhouse cheese. Hand-baked in small batches to ensure quality and consistency, they contain no additives. Like our cheese, the biscuits are made by hand using simple, good quality ingredients. From the elegant shape and fine crisp snap of the Charcoal, Rye & delicate Caraway Biscuits, to the golden toasted nuttiness of the Oat Biscuits, they are the perfect accompaniment to your cheese board. Learn more about each of our biscuits and their perfect pairings. Seasonal fresh produce is delivered each week from the markets in Italy, France and various farms in the UK. Our offerings change with the seasons. We also consistently have available unwaxed leafy lemons and an array of vine ripened tomatoes including San Marzano, Cuore di Bue and Camone from Italy. In addition, we have purple cadours garlic from sw france, Roscoff onions from Normandy and Noirmoutier potatoes from the ile de re in the west of France; and from England we have heritage apples, pears and quince and soft fruits from the Brogdale Collection in Faversham, salad leaves from Cornish growers, and potatoes from Chris Hayselden's farm in Suffolk. Throughout the day each of our shops offers a selection of coffees and teas along with pastries and cakes to sit in or take away. We also pride ourselves on our regional cheese boards, curated each day by our cheesemongers and offered with wine pairings available by the glass or bottle. At our Marylebone and Highbury locations we also offer a full breakfast and lunch menu, and at our Bloomsbury location we offer daily breakfast, lunch and dinner menus. Our menus change daily to allow us to make the most of seasonal produce - to learn more, view our daily menus by location: HIGHBURY, MARYLEBONE or BLOOMSBURY. 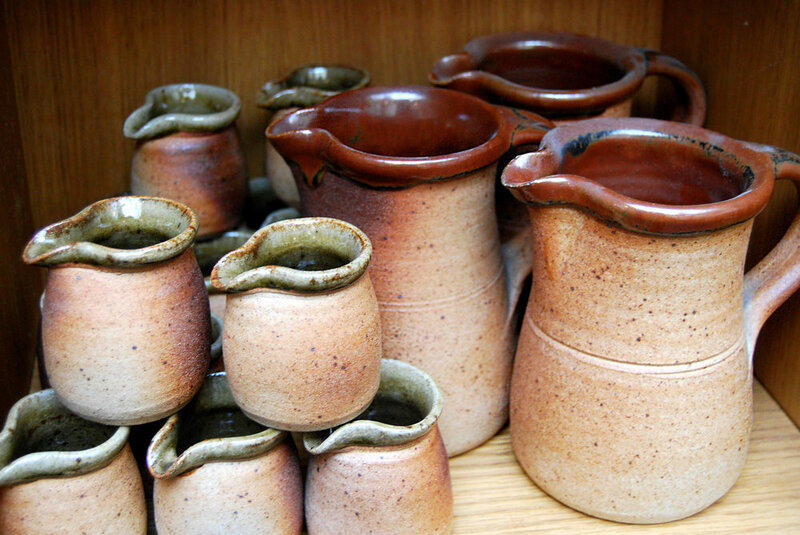 Below we have listed some of our fabulous dry store goods, however there are many other seasonal items that we stock throughout the year, making it an eclectic mix – if you do not see what you are looking for, please ask. We are also happy to assist with information on preparation and regional menu ideas. Aged Balsamics from Modena. Aromatic herb and spiced vinegars from Volpaia. Various extra virgin olive oils carefully sourced to cover all spectrum of tastes: from Provençal, Moulin de Callas, grown in the hills above Grasse; our Ligurian oil is from Elena Luigi; in the kitchen we use a Calabrian olive oil, Macri; from Tuscany we have San Polino, an organically produced oil from Olivastra olives, a variety indigenous to Montalcino; La Macie de Ponte alle Granchiai; Organic Kalios from southern Peloponnese; and Definca Oleum Flumen from Lleida, favoured by Ferran Adrià. From Moulin de la Tour in the Dordogne we stock walnut and hazelnut oil, as well as raspberry and walnut vinegars – including an exceptional walnut mustard. From Norcia we have Castelluccio lentils, Fave, Cannellini and chickpeas, along with Strangozzi 'rope' pasta. From Venice we have the colourful Harlequin pasta ribbons – perfect with shellfish sauces. Coarse Polenta, Black Rice & Carnoroli Rice from Piedmont for soothing winter dishes. We have sourced Lima beans, Farro and Cicerchia from Marche. From France we have the highly prized Flageolet beans known as 'the caviar of beans' – an essential in French cooking. From the Pyrenees and Valtelina we have an extensive selection of herb and floral honeys – including a fabulous cut honeycomb. 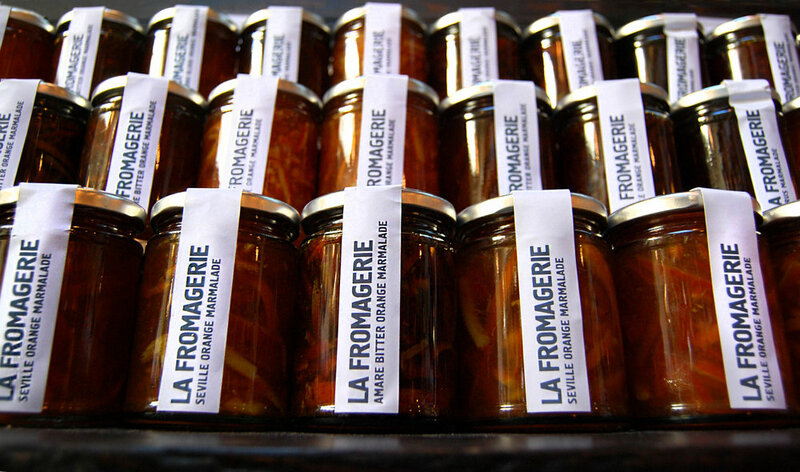 Various mostarda fruits from Mantova, as well as wine jellies – perfect for blue cheeses, foie gras, and terrines. Scented rose petal jam from Genoa. Chestnuts and chestnut paste from Cevennes, and other essential condiments including Anchoïade, various mustards and black truffle paste. From wet sea salt from Ile de Ré to organic sea salt from Sicily. Vegetable stock cubes & stock powder from Veneto. Dried first grade Porcini mushrooms. Organic Pinenuts from Liguria. Peppercorns, cinnamon and nutmeg from Sri Lanka. From Madame Vie in Toulouse we have violet syrup, tea and essence, perfectly complemented by lavender or rosemary essence from Castle Farm in Kent. LA FROMAGERIE sources and uses in our café Le Piantagioni Coffee. Renowned throughout Italy, their coffee is produced by Carlalberto Relli just outside of Florence. The beans are grown on their company-owned plantations in Bolivia, Ethiopia, Guatemala, Peru, India and Brazil, and are then imported to their roasting plant, producing a coffee of exceptional quality. Details on specific varieties can be found here. Our herbal teas come from Milly-la-Florêt, a protected area outside Paris renowned for its peppermint. Our producer also makes excellent Lemon Verbena, Lime Blossom and Hibiscus teas, which we stock as well. We also carry a selection of leaf teas from Robert Wilson's Sri Lankan Estates. We source our specialty charcuterie from around Europe. Starting at home, we source from Crown & Queue, a London charcuterie maker that uses British heritage pork and locally-grown ingredients. The from France we supply Bayonne Ham from Biarritz and Saucisson Sec from the Pays Basque, while from Spain we import superb Pata Negra Iberico ham, Lomo, Pata Negra slicing Chorizo. Finally, our Italian charcuterie: we offer Speck with rich smoky flavours from Alto Adige, 'Cinta Sinese' from Tuscany from the black foot pig, along with Guanciale 'Cinta Sinese', Manzo Marinati al Chianti, and San Marcel, Bresaola and Pancetta d'Arnad from Aosta. Each of our locations stocks a selection of homewares from wooden and marble cheeseboards to cheese knives and fondue sets, to traditional linens produced in Basque. Our Marylebone and Bloomsbury locations also offer tableware and John Leach pottery, and our Bloomsbury shop features an ever-changing collection of antiques sourced from France. For more information about specific products or items, please contact our stores directly as our stock is frequently changing.